Shore Lunch breading/batter mixes are shere the journey to outdoor flavor begins. 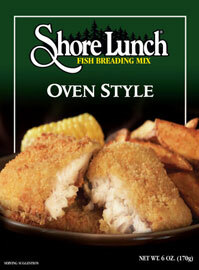 Shore Lunch Oven Style Breading is an easy-to-prepare crunchy breading that brings out the best in your favorite foods. Preheat oven to 400 degrees. Place dry batter mix and egg into shallow bowls. Dredge fish in egg and then immediately dredge in dry batter mix. Place in preheated oven and bake uncovered until done, about 15-25 minutes. Fish is done when it flakes easily with a fork. Let fish stand for 3-5 minutes before serving. Bread crumb (bleached wheat flour, dextrose, modified wheat starch, mono and diglycerides, soybean oil, salt, yeast, caramel color, extractive of paprika, natural flavors, soy lecithin), bread crumb (enriched wheat flour (wheat flour, niacin, reduced iron, thiamine mononitrate, riboflavin, folic acid), dextrose, mono and diglycerides), wheat flour, salt, soybean oil, wheat gluten, monosodium glutamate, dehydrated garlic, sugar, onion powder, spices, flavor (hydrolyzed wheat gluten, partially hydrogenated soybean oil), maltodextrin, starter distillate, spice extractive.